These results also appear on an official KGS page. The first round started at 08:00 UTC. 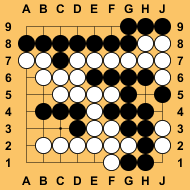 Black won 32 games, White won 30 games, and there was 1 jigo. In round 3, NiceGo19N and gnugo3pt8 both passed in the position shown to the right. They were right to pass, the game is over, and White is 16 points ahead. However they disagreed about the status of the dead groups, entered the clean-up phase, and both passed again. So the game was counted with all the stones treated as alive: White won by 1 point. This surprised me. In the past I have seen GNU Go handle the clean-up phase correctly. In round 7, gnugo3pt8 and NiceGo19N both passed in the position shown to the left. They were right to pass, the game is over, and Black is 14 points ahead. However they disagreed about the status of the dead groups, entered the clean-up phase, and both passed again. So the game was counted with all the stones treated as alive: Black won by 6 points. In round 12, Zen19S lost its only game of the tournament, to AyaMC. The start of the game is shown to the right. Zen19S's operator Hideki Kato commented "The opening was, I guess, good for Aya. 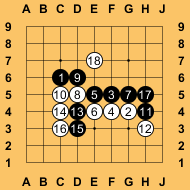 E7 (18th move) looks [like an] overplay". 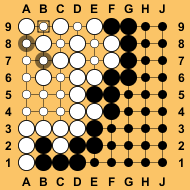 Also in round 12, NiceGo19N and gnugo3pt8 played a game which ended, after scoring, as shown in the diagram to the left. This time, they have marked the dead stones correctly, and there is no problem with their behaviour or the result. However the diagram, copied directly from KGS, shows a ko restriction on B9. When I noticed this, I thought, "that's wrong, a ko resriction cannot still be in place after the game is over". But on reflection, I think it is correct. Of course it normally doesn't matter, after consecutive passes no more moves are made, so a ko restriction is irrelevant. But if a game enters the clean-up phase it might matter. And the superko rule implemented on KGS is "a player may not play a stone so as to create a previous board which existed previously in the game." 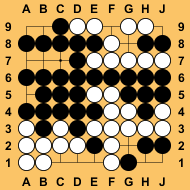 So, I believe, Black is forbidden to play at B9 in the position shown, and the server is right to show a black square (indicating a ko or superko restriction) in the diagram that shows the results of scoring. Details of processor numbers, power, etc. Many Faces of Go, running on an Amazon EC2 Cluster Compute Eight Extra Large Instance, 2 x Intel Xeon E5-2670, using 16 cores, 16 threads, and 48 GB of memory. GNU Go version 3.8, running at its "level 19", with Monte-Carlo enabled, on a single 3.3GHz Intel i5-2500 CPU. Orego, running on five nodes of our custom Linux cluster Fido. The node has two AMD Six Core Opteron 2427 2.2 GHz processors (60 cores total), 8 GB RAM, Centos Linux. Zen, running on a mini-cluster of a dual 6-core Xeon X5680@4 GHz 24GB RAM, a 6-core i7 3930K@4 GHz 16 GB RAM, a 6-core Xeon W3680@4 GHz 12 GB RAM, and a 6-core i7 980X@4 GHz 6 GB RAM computers connected via a GbE LAN. 30 cores total.